Olivia Dress with embroidery on the chest and in the back.Very short sleeves to cover the shoulders.Invisible closure in the back. Lined dress, perfect fo summer. Available in pink, in white and in teal blue. Olivia Timeless and elegant dress with hnd beaded necklace.Very short sleeves to cover the shoulders.Invisible closure in the back. Available in pink and in white. Olivia Timeless and elegant dress with hand beaded necklace.Very short sleeves to cover the shoulders.Invisible closure in the back. Lined dress, perfect fo summer. Available in pink and in white. Olivia Beautiful back crossed dress. Lightweight fabric, perfect for summer. 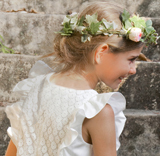 This dress is the perfect outfit for any ceremonies. Available in pink or yellow. 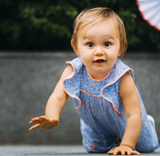 Florantine Beautiful romper with a crossed back.Snap buttons at the crotch and on the chest to help with dressing.Lightweight fabric, perfect for summer. Available in pink or yellow. Olivia Dress with eyelet lace on the collar and shoulders.Knot to tie in the back. Invisible closure in the back. Lined dress, perfect for summer. Available in orange and pink. Also in the same collection : the romper and the skirt. Capucine Skirt with eyelet lace at the end of the skirt.Two pockets on both side and elasticated waist. Vivid color, perfect fo summer. Available in orange and pink. Also in the same collection : the dress and the romper. Augusta Romper with eyelet lace on the collar and shoulders.Snap closure at the crotch to help in dressing. Vivid color, perfect fo summer. Available in orange and pink. Also in the same collection : the dress and the skirt. Olivia Dress with eyelet lace on the collar and shoulders.Knot to tie in the back. Invisible closure in the back. Lined dress, perfect fo summer. Available in orange and pink. Also in the same collection : the romper and the skirt. Olivia Cute little dress with floral prints. V Neckline on the back and red buttons to facilitate dressing. 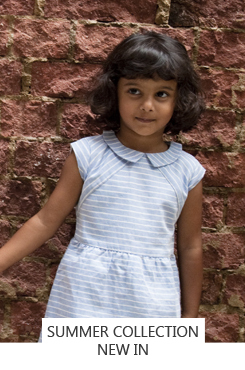 Olivia Pretty blue dress with a pleated collar and buttons along the chest, elasticated at the waist. Pleats at the waist to create a chic look. Olivia Pretty pink dress with cactus patterns, a claudine collar and buttons along the chest.Trapezoidal effect from the waist up. Olivia Pink dress with small sleeves and a cord to tie at the waist. Elastic at the head level to facilitate dressing. 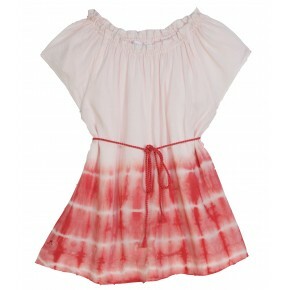 Olivia Girl dress short sleeves and ruffles with two different shades of pink. Top of the dress with glitery pink stripes. Buttons on the back to assist with dressing. Very pretty, take a look to the princess ! Available in pink and in blue. 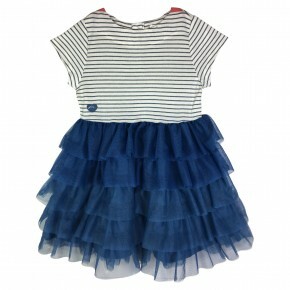 Olivia Girl dress short sleeves and ruffles with two different shades of blue. Top of the dress with glitery blue stripes. Buttons on the back to assist with dressing. Very pretty, give a look to the princess ! Available in pink and in blue. Olivia Girl coral dress with blue embroiries on the sleeves, on the chest and at the end.Sparkeling touch of Chateau near the leg.Buttons on th back for an easy dressing.Very easy to wear and super confortable.Available only in coral. Matching baby girl romper and blouse in the same collection. Olivia Beautiful backless dress with a cross back with lace trim. Delicate lace on the chest. This dress is the perfect outfit for any ceremonies. Available in white or dusty pink. 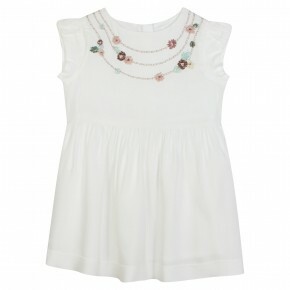 Olivia Pretty white dress with a peter pan collar and sequins on the chest for a chic look. Pleats at the waist to create a chic look, back zipper to facilitate dressing and strass logo at the bottom. 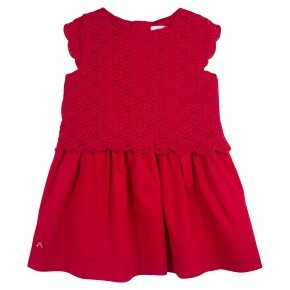 Olivia Perfect dress for your Festive moments! Elegant with fine details on the chest and with ruffles. Low waist skirt in cotton. Back zipper to assist in dressing. Heart logo embroided on the side. 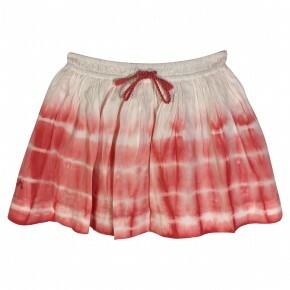 Capucine Pink skirt with an elastic at the waist with a lovely knot. Easy to wear and particulary with a top. Capucine Pink ruflles skirt with glittery stars at the end of the knot.Elastic at the waist. Available in pink and blue. Capucine Girl floral skirt. Elasticated waist to assist in dressing. Capucine Girl turquoise skirt with birds prints. An elastic at the waist with a lovely knot. 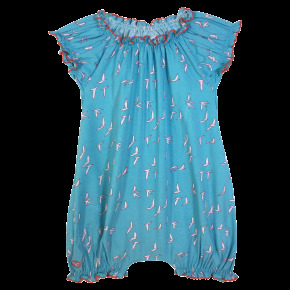 Augusta Beautiful turquoise elasticated romper with birds prints, cap sleeves and flounce collar. Augusta Beautiful pink elasticated romper with cactus prints, cap sleeves and flounce collar. Very confortable. 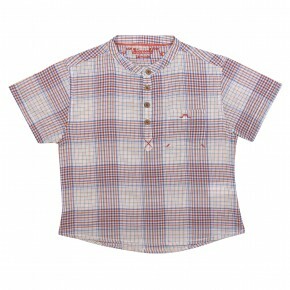 Louis Shirt with short sleeves and checks in blue, orange and red.Small pocket on the chest.Coconut buttons on the chest. 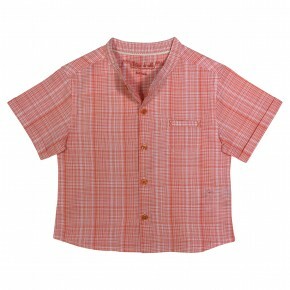 Louis Short-sleeved red shirt with a chinese knot. A chic outfit perfect for a celebration. 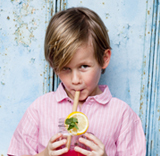 Louis Long-sleeved white boy shirt with little pig prints. Grey buttons down alog front placket assist in dressing. The perfect outfit for Chinese New Year ! Louis Boy grey tee-shirt with cactus prints. A green pocket on the left chest adorned with a wood button. 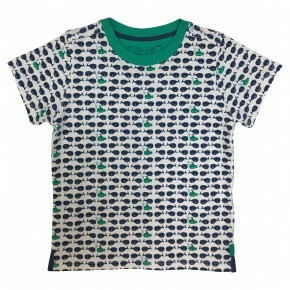 Louis Boy white t-shirt with blue fishes and green submarines prints. Green collar. Very confortable and perfect for the beach. Hugo Boy long pants with welt pocket on the back. Front opening with button and a zipper. Embroided logo on the side. Available in white, blue, and beige. Louise Girl t-shirt with a collar with glitters. Available in pink and champagne. 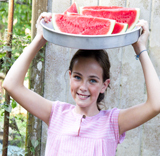 Louise Girl classic white shirt crafted in cotton with a front pocket, so comfortable she will wear it all summer. 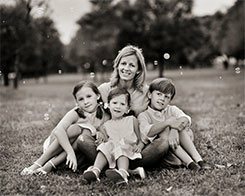 Louise Classic girl orange and blue shirt crafted in cotton with a front pocket, so comfortable she will wear it all summer. Louise This short sleeve cotton blouse is finished in our liberty Katie & Millie print and can be easily pair up with our basic pink short. Inverted pleats, coral buttons on the back for easy dressing and embroidered strass logo at bottom. 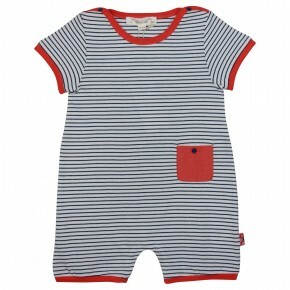 Auguste Baby romper with navy stripes and a front pocket. Buttons on the shoulders and crotch to assist with dressing and changing. Available in pink and blue. 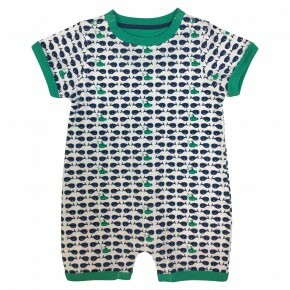 Auguste Cute white baby romper with blue fish and green underwater prints. Snaps on the shoulders and crotch for easy dressing. Green collar and sleeve borders. 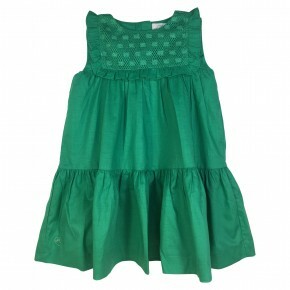 Louise Elegant blue blouse for girls with wood front button and cap sleeves, perfect for the summer season. 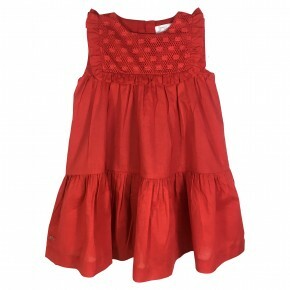 Auguste Red romper with short sleeves in plain colour. Logo sewn on the bust, hidden buttons all along to make dressing easier. 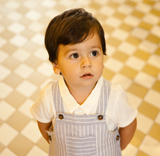 Auguste Short-sleeved rompersuit with houndstooth prints. Matching buttons down along to assist in dressing. and two pockets. Logo embroidered at the bottom. Available in blue and taupe. Capucine Yellow skirt with rhombic prints and two pompons. Two pockets on both side and an elastic at the waist. 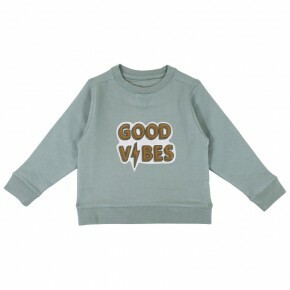 Louis Boy sweatshirt with "Good Vibes" print on the chest. Ribbed collar, cuffs and hems. Available in khaki and blue. 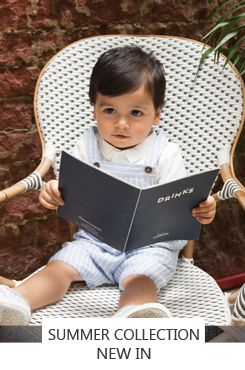 Amge Baby blue bodysuit with colorful little triangles prints which give it an original look. Snap buttons at the crotch. 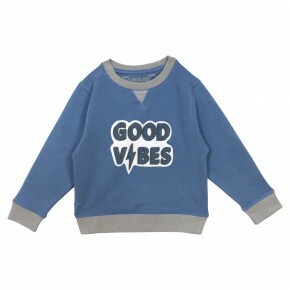 Made at 100% in organic cotton to take care of baby health. 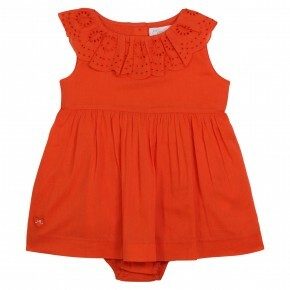 Louis Orange t-shirt with short sleeves.Soft finishes to avoid hitches. Small pocket on the chest.Snaps along the bust. Louise Girl blue shirt with gold and white buttons on the back.Round collar on the front, light V-neck on the back. Very confortable and soft. 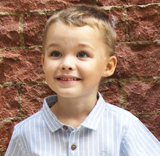 Louis Boy shirt with a pretty officier collar style and short sleeves. Embroidered logo on the chest and buttons all along the bust.Very confortable and easy to wear. Louise Girl white t-shirt with gold and white buttons on the back.Round collar on the front, light V-neck on the back. Very confortable and soft. Louise Yellow sleveesless t-shirt. Very confortable, basic and perfect for the summer. Available in coral. 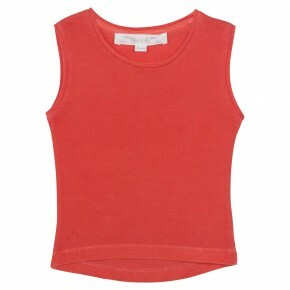 Louise Coral sleveesless t-shirt. Very confortable, basic and perfect for the summer. Available in yellow. 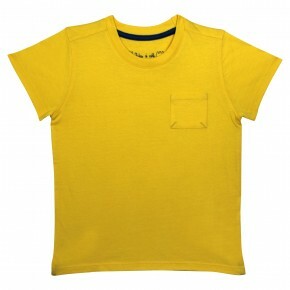 Louis Boy yellow basic t-shirt with a pocket on the front. 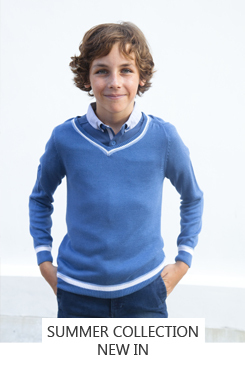 Little blue details inside and at the bottom of the shirt.Very confortable, perfect with a short or with pants. Exist aslo in blue. 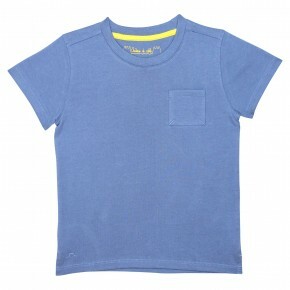 Louis Boy bleu basic t-shirt with a pocket on the front. 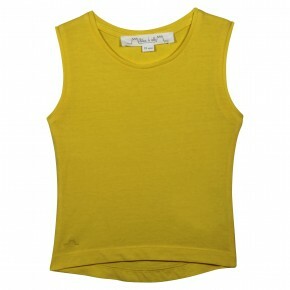 Little yellow details inside and at the bottom of the shirt.Very confortable, perfect with a short or with pants. Exist aslo in yellow. 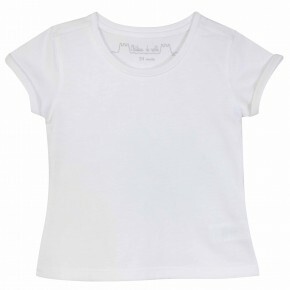 Louise Basic girl white t-shirt that you can pair our classic shorts.Very confortable shirt and perfect for the summer. It goes with everything, a realy basic that everyone need to have. Louise Basic girl blue t-shirt that you can pair our classic shorts.Very confortable shirt and perfect for the summer. It goes with everything, a realy basic that everyone need to have.